The aim of the British Fertility Society (BFS) is to promote expertise in fertility and reproductive medicine. It is a members’ organisation consisting of medical professionals, scientists, counsellors, students, lawyers and anyone involved in human fertility. For organisations like this, member engagement is crucial, as is a platform that is simple to use for both members and management. And that’s precisely what Figment delivered. Rebranding BFS. A Fresh Take on an Established Identity. An organisation as respected as the British Fertility Society is right to want to maintain the identity it has built up over the years. But it’s equally important to keep branding looking fresh and appealing. And that was the mission set to Figment by chairman Jane Stewart and the Executive Committee: to preserve the familiar foundations of the brand, whilst uplifting it to appeal to its newer members. Mission accomplished. A satisfied chairman and committee, and a refreshed yet reassuringly recognisable feel. Website Design. Memberships up. Management Time Down. With a fully responsive website that’s more appealing and better at selling membership benefits, Jane tells us she’s delighted at how sign-ups have increased. 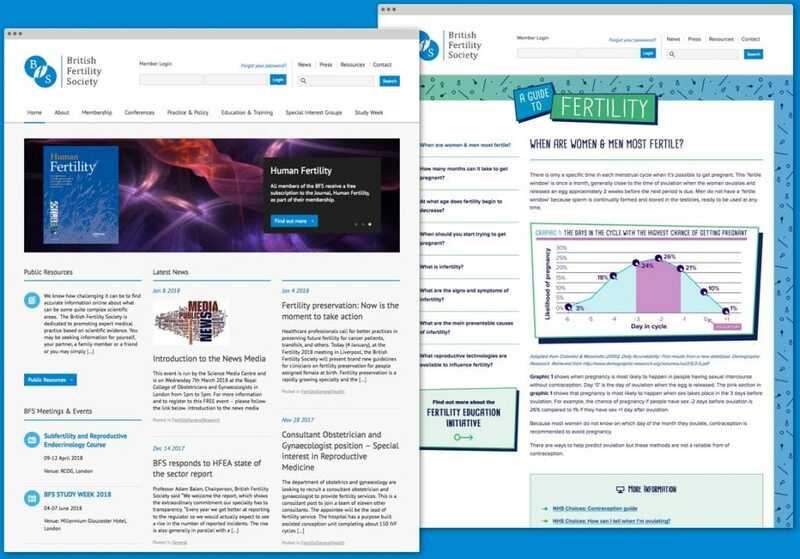 Plus there’s a separate microsite designed to deliver crucial information to families on fertility issues. Engagement has been given an even bigger boost as a result. Even better for BFS reports Jane Stewart, the site is a cinch to update. Staff can post news, information and social updates under their own steam. We even created a mobile friendly e-newsletter that complements the website perfectly. So now the organisation can keep in touch with its members on a regular basis. A Bespoke Members’ Area. Reinvented for True Member Satisfaction. For any organisation, member satisfaction is essential. And that’s certainly something that’s been achieved since Figment reinvented the exclusive members’ area of the BFS website. Through this bespoke-created, WordPress-driven platform, members can login to access exclusive content, respond to colleague comments and apply for travel bursaries. It’s all protected behind a password secure wall. There’s a join-up and payment process embedded into the system too, making new member acquisition nice and simple. 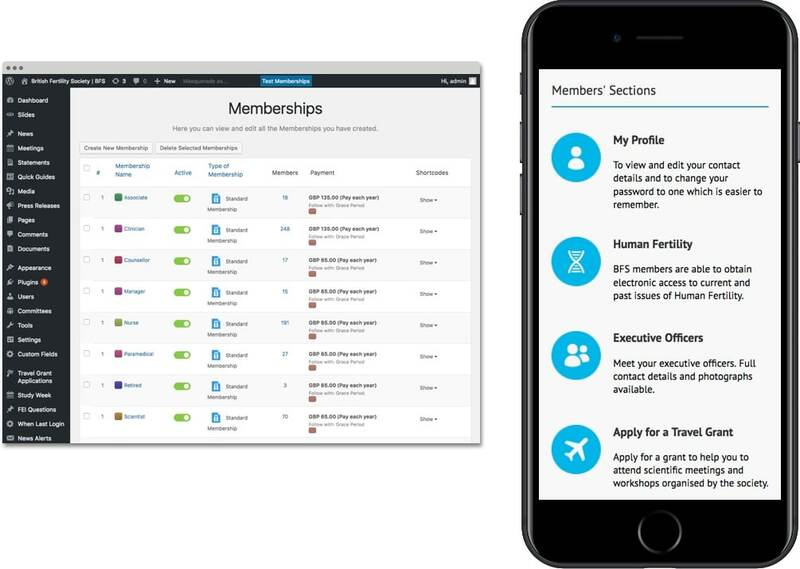 Jane has confirmed to us that the experience is just as appealing for the committee’s secretariat whose job of administering memberships and making important grant applications is now a whole lot easier. From the outset Figment have shown initiative, enthusiasm and expertise. With great good humour they have produced a site which is fresh and modern and importantly a flexible tool that we can control directly allowing much greater involvement with our membership. The ongoing support has been both professional and personal. It has been a learning experience for us all but moreover a lot of fun!